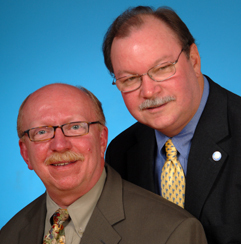 Hansen ( left ) and Bergfalk have been partners since 1984, and both have supported gay organizations since the 1970s. Bergfalk has been a volunteer and donor. Groups he helped with include IMPACT, American Library Association gay task force, The NAMES Project, 46th Ward Gay Democrats, Gerber/Hart Library, and many more.